Catholic Fried Rice: Catholic Fried Rice Get Press! Catholic Fried Rice Get Press! I just happen to be in the back of the line when the reporter approached Mike and me. 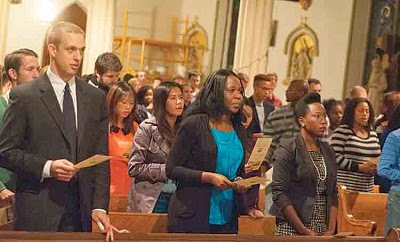 We were Partying DC Catholic style at the ADW Young Adult Mass said by Cardinal Wuerl and she asks, "How do you evangelize?" I looked at Mike and we both kind of laughed. He says, "There you go man, free press." "I know it's kind of a hard question to answer," she says. "It's not that," I reply. "It's just, well, my friends are going to make fun of me for telling you this, but I guess I try to evangelize through my writing..."
Matt Aujero, a Catholic blogger and speaker, said he finds blogging to be an effective way to evangelize on a regular basis. He reflected on how some people hold a negative view of Church teachings, laden with restrictions and "No's." In his writing, he says, he tries to concentrate on the "positive and loving messages," of the Church and emphasize a lifestyle of saying "yes" instead of saying "no". Matt's writings can be found at www.catholicfriedrice.com.